Golden State's defense made LeBron James work hard for his points during the four-game sweep. CLEVELAND –The Golden State Warriors remain at the top of the basketball world. This time, the Warriors took care of business in Game 4 of The Finals, finishing the 2017-18 season off with a 108-85 victory over the Cleveland Cavaliers. Stephen Curry (37 points) and Kevin Durant (20 points, 12 rebounds and 10 assists) led the way, and the Warriors' defense was terrific, holding the Cavs to just 34 percent shooting. Durant was named Finals MVP for the second straight year. One stat stood out from the rest as the Warriors won their second straight championship and their third in the last four years. 100.5 --Points allowed per 100 possessions by the Warriors in the postseason. What makes the Warriors as good as they are is that, at their best, they are both the league's best offensive team and its best defensive team. The champs have never relied on just their talent to get by. Well, maybe a little bit in the regular season after three straight trips to The Finals. After ranking in the top four defensively in each of the previous four seasons, the Warriors fell to ninth in defensive efficiency this year. It was the product of fatigue and disinterest, and it frustrated the coaching staff. But in the postseason, the Warriors flipped the switch defensively. They were the No. 1 defensive team in each round of the playoffs, holding all four opponents to at least five fewer points per 100 possessions than they scored in the regular season. The 100.5 points per 100 possessions they allowed were both 2.5 fewer than any other team allowed in this postseason and 3.7 fewer than the Warriors allowed in the regular season, making them the most improved defensive team from the regular season to the playoffs. The Warriors' defense was at its best with their season on the line. In winning games 6 and 7 of the conference finals, they held the Houston Rockets (one of the best offenses in NBA history) to just 92 points per 100 possessions. And they did that without one of their best defensive players, Andre Iguodala, who missed the last four games of that series and the first two games of The Finals. Of course, the Warriors' most impactful defender remains Draymond Green, who led the postseason with 41 steals and 79 deflections, while ranking second with 31 blocked shots. 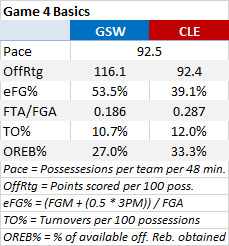 The Warriors were more than five points per 100 possessions better defensively with Green on the floor (allowing 99.5) than they were with him off the floor (104.6). The Warriors' talent is a problem for the rest of the league. That the Warriors' talent plays great defense is an even bigger problem.